Wich blue plastic do you mean? Maybe you read the link in post 11. Most thermal adhesives are silicone! Last edited by Scooby-Doo; 01-25-2015, 22:30.
during prime @ 50Â°C how much cpu clock speed did you get? can you remember or check this, please? Hardware Monitor showed about 1600 Mhz (1596 exactly), with prime. It wasnÂ´t possible to force higher core speeds. But other programms canÂ´t do that, too. Maybe its a problem of the bios, where the clock speed is defined with 1,33 Ghz (no possibility to change it). 2 Ghz permanently wasnÂ´t possible, only short peak frequencies > 2 Ghz. Maybe the guys of the bios threat will find a solution for that problem. Now you have done your heat modding you couldn't try a 1080 stream, pref a blu Ray disk? Nice explanation, but I had 100 % on all 4 cores. 1080p Streaming is less interesting, because it uses less than 40 % cpu. The temperature on all cores is about 45Â° C.
The important Thing is, that I never ever got a temperature maximum over 50 - 53Â° C past two weeks, even alter 6 hours prime instant video streaming, three hours HD gaming. I wanted to give an example, how easy you can mod this box. I think you can mod it better, with better heatsink. Lower the temperature more with aircooling or better watercooling and so on. What I wish is the feedback of the guys who have realized other or better modding ways, to optimize the box even a bit more. This would be interesting, especially if someone finds a way to overclock it. P.s. : The big advantage of the cooling pad is, that the box has an alu case. Before I put the Pad the case was very cold even after hours of playing around with it. 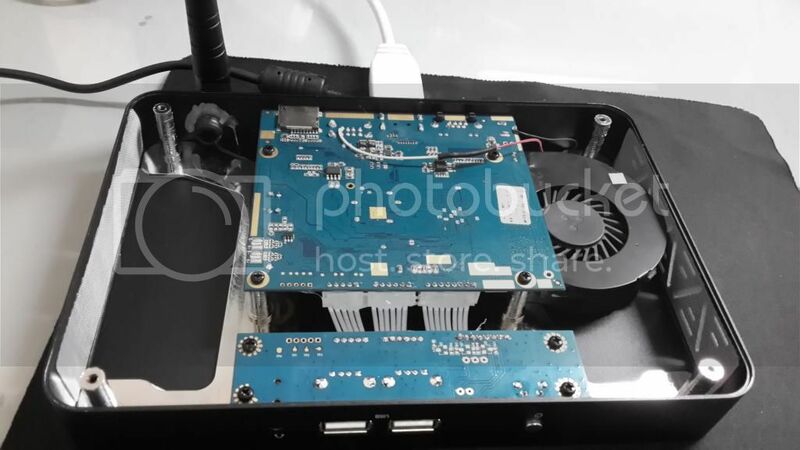 But the cpu had up to 80 Â° C.
Now the case gets warm and the cpu keeps cool between 40 and 50 Â° C.
According to a post by Gearbest on another thread Pipo have paused production of the X7 at the moment. I can't help wondering if this is to implement some design mods? Perhaps one to improve cooling????? Or the Windows 8.1 with Bing and Office 365 bundle that appears very much to be a Tablet version (when I registered mine it definitely talked about a tablet...) has been clamped down on by MS? very goog price, but delivery time to Germany is very long. I didnÂ´t want to wait. For those people with patience itÂ´s a very good deal. They can mod the box low cost.